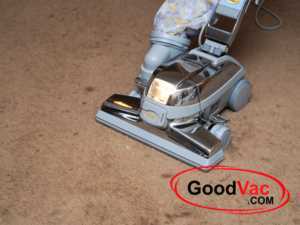 Goodvac.com is not affiliated with The Kirby Company and/or The Scott Fetzer Company. All manuals and maintenance tips for Kirby vacuum cleaners and repair manuals for Kirby model vacuums are authored by GoodVac.com and are not endorsed or approved by the Kirby vacuum manufacturer - Kirby Company and/or The Scott Fetzer Company. These materials should be only used at your own discretion and risk. .
BACK to "Standard set user manual"
Before shampooing rugs with any shampoo system you want to vacuum as good as possible. Spend 2 or 3 times more time vacuuming the area as you normally would. If you don't you can find them in out Kirby Shampooer Parts section or you can buy entire Kirby Shampooer. Brush ends are different so it is impossible to put it in wrong. Slide the nozzle over the tray and brush assembly. Turn the knob to match red arrows. When turning the knob hook inside the Kirby shampoo nozzle catches the belt, stretches it and now it is ready to be installed on the Kirby vacuum. To install the nozzle with tray you must have the Kirby front all the way up. Simply press on the pedal as far as it can go. Put the nozzle on, lock it onto the unit with the latch and twist the knob back (clockwise) to match green arrows. Essentially this is the same as installing a regular nozzle so if it is still not quite clear - see NOZZLE INSTALATION INSTRUCTIONS. Make sure Kirby shampoo tank has sponge (on the left) and suds screen (on the right). Sponge will prevent dust from Kirby exhaust clogging Kirby shampooer and the screen is necessary to make the foam. If Kirby shampooer has no screen - look in the shampooer hose as sometimes it stays there when taking shampooer apart. If suds screen keeps falling out of the tank - use plumbers tape or use lighter to heat up a bit the plastic neck where the screen is inserted and push plastic a little bit in. Be careful - do not set plastic on fire and do not burn your fingers. Do it where it is safe so you do not set you house on fire. NEVER glue the screen in - you may have to remove it to clean. Kirby shampooer tank has 3 marks. This indicates how many capfuls of Kirby shampoo you have to add in the tank (shampooer tank cap acts as measuring cup). If you have water up to the first line - 1 cap full, if up to 2nd line-2. If up to the third line - you guessed it - 3 capfuls. Use warm or cool water. Never use hot water as it may damage the tank. This ratio is if you are using regular (non concentrated) Kirby shampoo. Install the tank with soapy solution in place of the bag, Nozzle with tray goes on the front of the unit just like the nozzle would. Connect Kirby solution tank and tray with the hose. Lower the tray all the way down as far as it can go. For very dirty carpet use shampoo pretreatment (Heavy Traffic) . Follow instructions on the bottle . Turn on the Kirby, set tech drive in DRIVE (pedal on the back of the unit Kirby G3 and later) and start opening the valve. Soapy solution is being sprayed onto the screen that we talked about and it generates the foam. Valve does not necessarily have to be open all the way. It should generate just enough foam to evenly cover the carpet (see second picture below). Foam has to be white and light. If you have just soapy water coming out instead - check the suds screen. Lay the foam by slowly pulling Kirby towards yourself. Before foam gets picked up it has to stay on the carpet for about 3 minutes. Shampoo in sections about 4 x 10 feet. Foam allows you to spread small amount of water over the large area. Then soapy solution loosens the dirt from carpet fibers and it is ready to be collected. When finished laying foam turn off the Kirby foam maker by turning the Kirby shampooer's tank knob to OFF position. Start picking up the foam where you started laying it as it would be sitting on the carpet for about 3 minutes now. Pull Kirby slowly in REVERSE over the foam. Since Kirby shampooer does not inject a lot of water in the carpet but only moistens the fibers - there is not much water to pick up. There is no suction involved at all. Kirby Shampooer brush roll scrubs and rubs the fibers, scoops dirty water off and throws it into the shampooer tray on the front of the Kirby unit. Normally you should expect to pick up about 30% of the water. The tray will start filling up with the dirty water so do not make sudden moves with the Kirby as you may end up dumping it all back in one spot and stain is almost guaranteed. You may have empty the tray. If there are some stains left you may want to use some Kirby spot remover. Spray it on the spots. Rub it in with a sponge (I prefer a brush) . Shampoo the treated spot again. Very dirty areas you may want to shampoo several times from several directions so all sides of the fiber meet the "Mighty Kirby Brush" . It looks clean but you not quite done yet. Let it dry completely (normally takes 1-3 hours, if you did 2-3 passes with Kirby shampooer it may take a bit longer). There is still some dirt left that brush did not scoop up but when drying shampoo does not let the dirt stick back to the carpet. After it dries some dirt is still there but it is dry and loose and can be picked up vacuuming. Take a few more minutes and thoroughly vacuum the dry carpet. Take everything apart. Rinse all parts EXCEPT the brush roll! Just let the brush dry. If you chose to dry parts with a towel or cloth - do not dry inside of the tank. Lint or paper may clog the valves and tube. Just leave it open and water will evaporate over the time. When putting Kirby shampoo accessory away for storage - do not twist the knob all the way (if you store the nozzle and tray assembled). Rubber will stretch and you will need a new belt. Simply turn the Kirby shampooer knob just enough for the hook to grab onto the belt but do not stretch it at all. This is all that is to our Kirby shampooer manual . There are many tips and tricks using Kirby shampoo but this should be enough (if not more than you need) to get you started.